Description: cast iron fondue set with gel warmer, 1 1/2 quart. 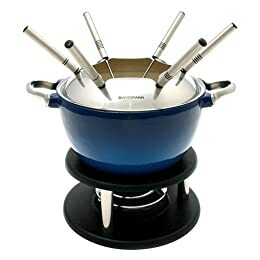 Conclusion: This is a nice fondue set with a cast iron pot and a gel warmer, complete with fondue forks and a spatter ring. This would make a great gift. Includes blue cast iron pot, spatter ring, 6 fondue forks, rechaud and dual-function burner"